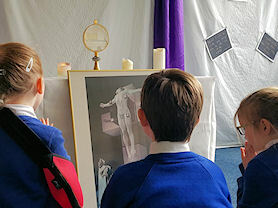 As a Catholic community we were lucky enough to welcome Christ into our school for the day. 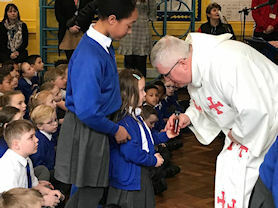 Children were actively involved in a reverent whole school Mass, led by Fr Maurice and showed outstanding respect for their faith; proving that the act of collective worship is central to our school community. 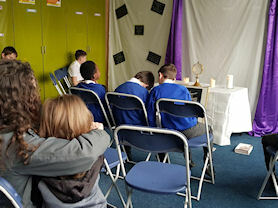 Children were taught about the Blessed Sacrament and the importance of it being held secure in the Monstrance. 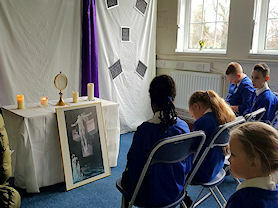 After a truly inspiring celebration of Mass the Blessed Sacrament was placed into a room, where children and families were invited to spend some time with Jesus, during their day. 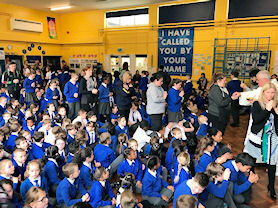 It was wonderful to welcome some of our families to spend this special time with us and empowering to see so many children actively taking the lead and showing heartfelt responses in their time of reflection. As a school we were thrilled to have this opportunity and are thankful for all those who have made it possible. It has shown us the importance of our faith and giving mutual respect to each other, as we strive to be the people God made us. 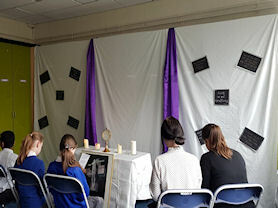 "It was wonderful because we had time to reflect and I enjoyed spending time with Jesus." "I really enjoyed the day because I got to reflect and think about how lucky I am. It helped me to stop and think about what I have. I particularly enjoyed the Mass, it felt special because it was more intimate." "I really enjoyed the Mass, it made me feel calm."